I'm going to be totally honest with you. I had to Google multiple times what Dave and I should wear for our engagement photos. I knew we didn't want to match, but I also knew we wanted to coordinate. Big difference. Also, I'm super sentimental, and I wanted to reflect things like how our wedding next year is over the fourth of July weekend, and how we have spent the last 3 years in Virginia. I know that is a tall order for just your outfits, but if you really sit down and think, it is totally doable! With some accessories and the overall feel and style of our outfits I think I was able to get the feel I wanted. One of the most important things you have to decide when you are first thinking about what you want your engagement photos to be, is what style of clothes you are going to wear. This will completely set the tone of the shoot. For us, we wanted to reflect our personalities, where we are in life, as well as what our wedding is going to be. But you might be in a totally different place in life, have an awesome story to tell, or want to include a special detail from your wedding or relationship. I wanted to emphasize that while all of these outfits coordinate with each other (some of them pretty closely!) none of them are matching exactly. This is important, because it can look very silly when two people are wearing the exact same outfit. I’ve seen some amazing shoots with couples who choose to wear formal wear. There is something so classy and almost James Bond-ish, about how the photos look. Perfect settings for clothes like this are industrial spaces or city scapes, but I have also seen beautiful images with formal wear in a country field, too. 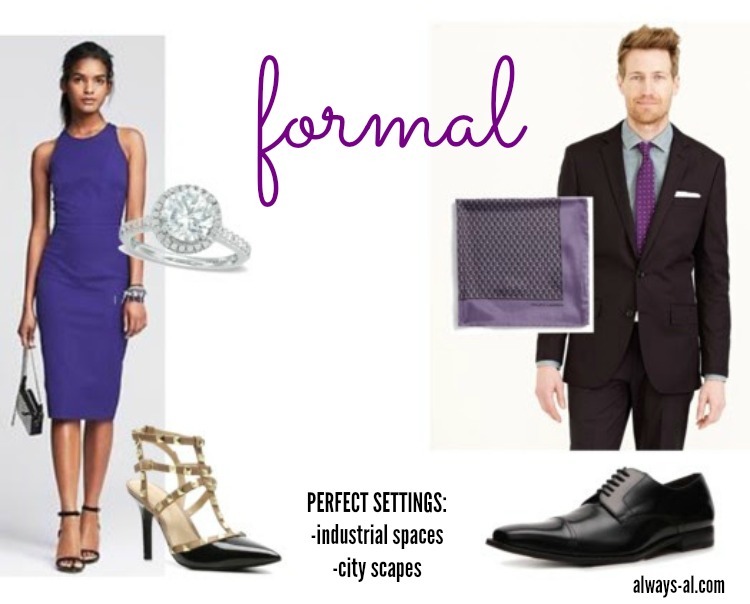 For this look I chose some higher end clothes, with a J.Crew suit for the Mr. and a Banana Republic cocktail dress for the future Mrs. And of course her look wouldn’t be complete without a large and in charge Vera Wang Collection diamond engagement ring. If you can’t tell, this is how we chose to dress for our photos. A casual dressy look portrays class as well as fun. 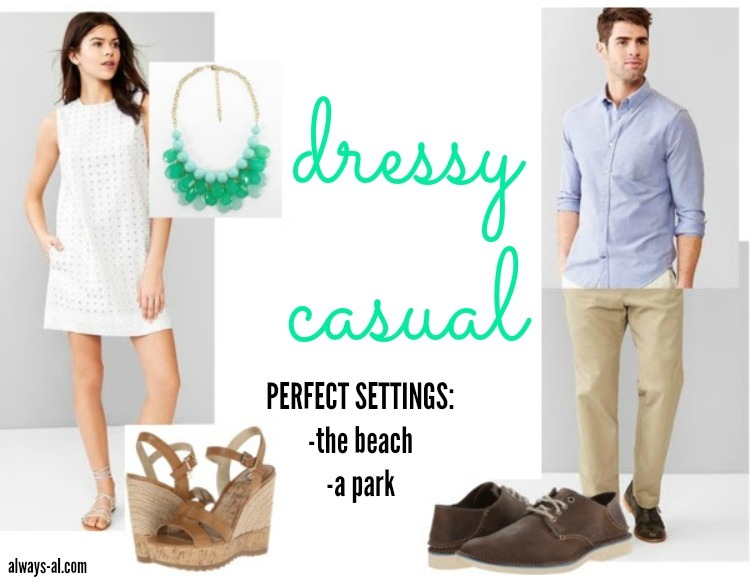 Some great venues for outfits like these include the beach and parks. We had our photos taken at Highland Park in Rochester, NY. We chose to stick to a blue and white color palette (very similar outfits as the couple above), to hint at our Fourth of July weekend wedding next year. With my white sundress, blue braided necklace, and Dave’s blue oxford shirt, I think it is a good subtle nod at the summer and the holiday, without being in your face. Finally we have a casually dressed couple. Casual photos scream fun to me. I love when photos look like they have caught a couple in a moment of their everyday life. A perfect setting for photos like these would be a picnic, or sometimes you see a secluded area like train tracks. 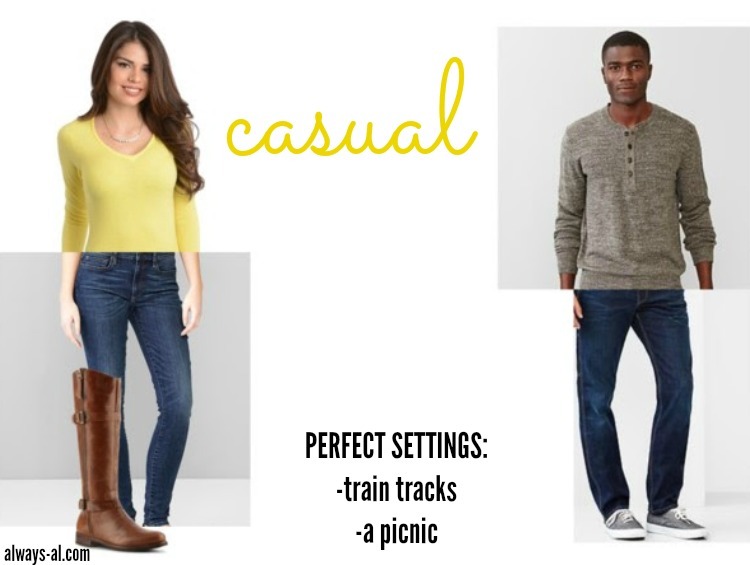 For a casual outfit, this couple is wearing dark jeans and sweaters, and the future Mrs. is wearing a pair of brown riding boots. Have you ever had photos taken? What are your tips for what to wear? No one ever tells you what to wear for your engagement pictures. 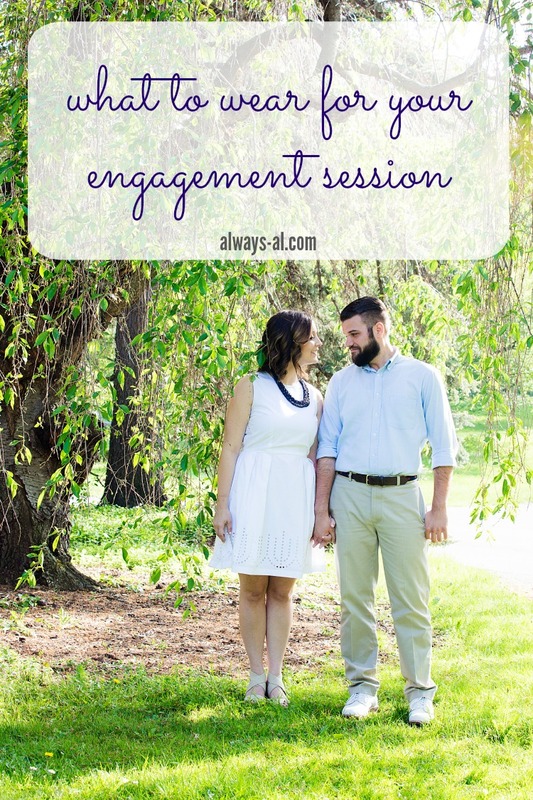 When we had ours done in March, I was like, "Okay, where's the person that just comes in and tells me the rules for dressing for an engagement session?" We totally just picked out something random, not gonna lie. But going back, if I could, I would definitely read these tips cause they would have helped me so much. I love the amount of thought you put into your outfits! It was pretty difficult for me to figure out what we were going to wear as well. I googled and pinterested for days. This is a great guide to help out. We mainly went off of the fact that it was winter, even though it doesn't look that cold in our pictures. But I love how y'all did colors for the 4th of July weekend.